FILE PHOTO: U.S. President Donald Trump and Chinese President Xi Jinping (R) shake hands prior to a meeting on the sidelines of the G20 Summit in Hamburg, Germany, July 8, 2017. 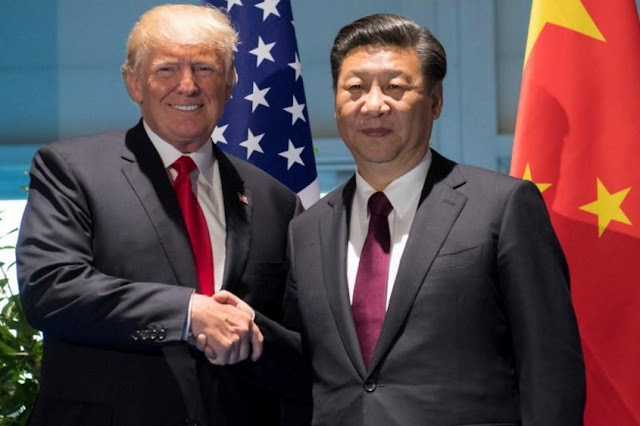 BEIJING - Chinese President Xi Jinping and U.S. President Donald Trump discussed the situation on the Korean peninsula by telephone on Monday, state news agency Xinhua reported. The two also discussed Trump’s coming China visit, Xinhua said. “Xi said China and the United States share extensive common interests and have seen sound momentum of exchanges and cooperation in various areas at present,” the report said. He called on both sides to work closely to ensure a fruitful trip and inject new impetus into the development of Sino-U.S. relations, it said. Xinhua did not provide other details. Trump will likely visit China in November as part of a trip that will take him to an ASEAN summit in the Philippines and an APEC summit in Vietnam. Chinese President Xi Jinping and U.S. President Donald Trump discussed the situation on the Korean peninsula by telephone on Monday, state news agency Xinhua reported.